When network performance could literally impact life or death, and it’s a 24×7 scenario, Uplogix is a prescription for better uptime while lowering support costs and locking down security vulnerabilities. Organizations need a secure, high performing healthcare IT infrastructure to ensure the smooth and safe distribution of medical and patient data throughout the network with minimal disruption. Bandwith-intensive applications such as Electronic Medical Records (EMR) and Picture Archiving and Communications Systems (PACS) are placing greater capacity and availability demands on the network. In addition, strict privacy and regulatory requirements, such as complying with the Health Insurance Portability and Accountability Act of 1996 (HIPAA), are taxing IT staff to ensure that the network infrastructure is always securely managed. Uplogix addresses these unique challenges. Uplogix Local Managers (LMs) collocate with network devices and servers to provide out-of-band, non-stop secure management and control, eliminating time-consuming and expensive tech support trips to remote locations to make routine network changes and repairs. From the Uplogix Control Center, administrators can centrally manage all network devices and systems connected to Uplogix LMs via an easy-to-use, web-based interface. Uplogix provides healthcare IT organizations with a solution that simplifies the management of a widely distributed and complex IT infrastructure, reduces IT support costs, maintains high network availability and service levels, and constantly enforces security and compliance auditing requirements. 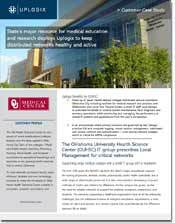 CASE STUDY | Seven health-related colleges distributed around downtown Oklahoma City use Uplogix to contribute to HIPAA compliance by automating routine system maintenance and monitoring with logging and access controls – even during network outages. There’s just too little time to focus on improving network performance and availability, or implementing new applications that advance patient care. With large groups of users and diverse equipment to support, using Uplogix makes a lot of sense. Healthcare network infrastructure can be monitored independently of the network itself, recovery actions can be automated, and smaller staffs can support distributed sites with fewer truck rolls. In the 24/7/365 world of healthcare, uptime is a requirement. The Health Insurance Portability and Accountability Act (HIPAA) requires any organization with access to personal health information (PHI) to follow its rules or face fines for data breaches. With much of its early customer base in the financial world, Uplogix developed its security posture to aid in compliance related to financial information. Whether it’s enforcing AAA (authentication, authorization and accounting) regardless of the state of the network, or logging all changes made to devices and their results, Uplogix improves overall security and makes it easier to document compliance.